Reading the pages of the Business Spectator in recent months I've noticed a seemingly endless stream of articles by Robert Gottliebsen claiming the US "shale gas revolution" will result in US energy independence, a resurgence in US domestic manufacturing and the demise of Australia's LNG export industry (unless the unions are crushed and construction costs dramatically lowered). I usually just write these sort of crazed ramblings off as some sort of PR campaign on behalf of BHP in particular (someone needs to give Marius Kloppers some good press) and the mining and energy industries in general, as they fight the endless battle of capital against labour. Maybe I'm missing something but from my high level understanding of the US gas industry, the natural gas "cliff" predicted by the likes of Julian Darley never eventuated courtesy of the shale gas boom - however US gas production isn't making new highs (so where is the glut people keep claiming exists ?) - instead the price collapsed due to a combination of manufacturing moving offshore (particularly gas intensive industries like fertiliser and chemicals) and the recession in the US causing demand to slump. Should the US return to growth and industry return based on the lure of cheap gas I think we'll find gas prices climbing rapidly again. The IEA gave this sort of delusional thinking (US energy independence ahoy !) more momentum recently with the new World Energy Outlook report echoing Citibank's claims earlier this year that the US will soon be the world's leading oil producer (again, thanks to shale oil). Its probably worthwhile remembering that 10 years ago the IEA was claiming global oil production would now be over 100 million barrels per day (currently it stands at 90 million barrels per day, with significant contributions from biofuels and natural gas liquids). Technology Review has a look at the report - Shale Oil Will Boost U.S. Production, But It Won’t Bring Energy Independence. The idea that the U.S. could overtake Saudi Arabia, even temporarily, is a stunning development after years of seemingly inexorable declines in domestic oil production. U.S. production had fallen from 10 million barrels a day in the 1980s to 6.9 barrels per day in 2008, even as consumption increased from 15.7 million barrels per day in 1985 to 19.5 million barrels per day in 2008. The IEA estimates that production could reach 11.1 million barrels per day by 2020, almost entirely because of increases in the production of shale oil, which is extracted using the same horizontal drilling and fracking techniques that have flooded the U.S. with cheap natural gas. The other potential issue is whether opposition to fracking in local communities might put the brakes on shale oil development, Sears says. Concerns that fracking will contaminate drinking water have led to objections in some areas, as have concerns that shale oil requires far more drilling wells than conventional oil production. Even if the U.S. is able to quickly develop its shale oil resource, it isn’t likely to be enough to completely eliminate oil imports. The IEA expects that the U.S. will still import 3.4 million barrels per day in 2035. The U.S. consumes nearly 19 million barrels per day, leaving a gap of more than 7 million even at the expected peak in shale oil production in the mid-2020s. However, the IEA expects the gap will be reduced partly by increased use of biofuels and natural gas in transportation, as well as improved vehicle efficiency, which could lower demand for oil. The IEA does conclude that the United States will nearly be energy self-sufficient by 2035, but that’s after offsetting oil imports with exports of coal and natural gas. To be truly energy independent, the United States would have to invest in technology for converting natural gas and coal into the liquid fuels needed for transportation, or have other technical breakthroughs, such as improved batteries or biofuels, that would quickly reduce the demand for oil. The Globe and Mail reports that Deutsche Bank analysts aren't convinced by the IEA's predictions for US oil production - Don’t bet on U.S. oil dominance. An influential report arguing that the U.S. will soon become the world’s largest oil producer made a lot of headlines, especially in Canada where the implications are huge. Too bad its findings are wrong, argue the energy analysts at Deutsche Bank. A combination of U.S. policy restricting exports and sagging domestic U.S. demand for oil products will keep prices soft relative to the rest of the world, making the projects needed to create the huge U.S. supply growth uneconomical, they wrote Thursday in their critique of the report by the International Energy Agency which pointed to a huge shift toward North America in oil production. OilPrice.com has an interview with longtime shale gas critic Arthur Berman - Shale Gas Will be the Next Bubble to Pop - An Interview with Arthur Berman. The “shale revolution” has been grabbing a great deal of headlines for some time now. A favourite topic of investors, sector commentators and analysts – many of whom claim we are about to enter a new energy era with cheap and abundant shale gas leading the charge. But on closer examination the incredible claims and figures behind many of the plays just don’t add up. To help us to look past the hype and take a critical look at whether shale really is the golden goose many believe it to be or just another over-hyped bubble that is about to pop, we were fortunate to speak with energy expert Arthur Berman. 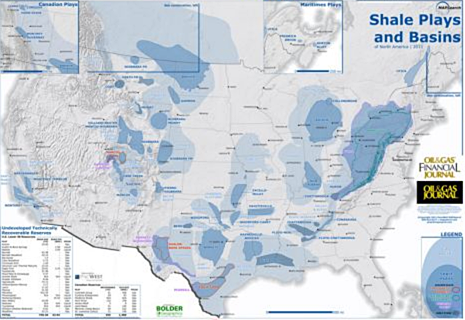 Oilprice.com: How do you see the shale boom impacting U.S. foreign policy? Now these people have shifted their focus and are putting cash into shale. There are two important things going on here, one is that the capital isn't going to last forever, especially since shale gas is a commercial failure. Shale gas has lost hundreds of billions of dollars and investors will not keep on pumping money into something that doesn’t generate a return. Oilprice.com: You've been noted suggesting that shale gas will be the next bubble to collapse. How do you think this will occur and what will the effects be? Oilprice.com: Energy became a big part of the election race, but what did you make of the energy policies and promises that were being made by both candidates? The Oil Drum also has some cynical words about the potential of shale gas - Tech Talk - Global Oil Supply . Stuart at Early Warning also has a post on the IEA report - IEA: US To Be World's Largest Oil Producer. Plus Energy Bulletin has a set of links to commentary too - Commentaries on the IEA WEO 2012 - peak postponed? - Nov 14.